A few weeks ago I came across an article by Beopjeong Sunim entitled, “Happiness in Solitude.” In the article he quotes Krishnamurti, one of the most renowned spiritual mentors of our time. If we can be in a place of complete knowing, being whole and unbroken, why do some of us choose not to be in solitude? On a cold, winter’s night in March of 2000 I found myself alone and weeping in my New York City apartment. I had left a long term relationship and I’d be living in that apartment for close to three months. I was absolutely petrified of being alone with my thoughts. In all honesty, I was afraid of confronting myself in aloneness. But I could do nothing to avoid it or escape from it. As painful as being in solitude felt I was approaching a new awareness of Self. I came to the realization that solitude was my saving grace above all else. Ego loves to exist with others, establishing new relationships and in the same token dependent on attachment. In aloneness there is no need to feel the presence of others, if in that place one finds true comfort in solitude. When that happens, all that one ever knows about oneself falls away. When all is authentic and not contributed by someone else, you are living and being Truth. Being in solitude gently removes the cobwebs of the mind, creates fresh thoughts and introduces us to the ever-so-present selves once again. We are our own guide, leading us with right speech to be whole and present with others again. In this journey of aloneness I found that solitude brings individuality from the rest of the world, but never separates us from self or humanity. 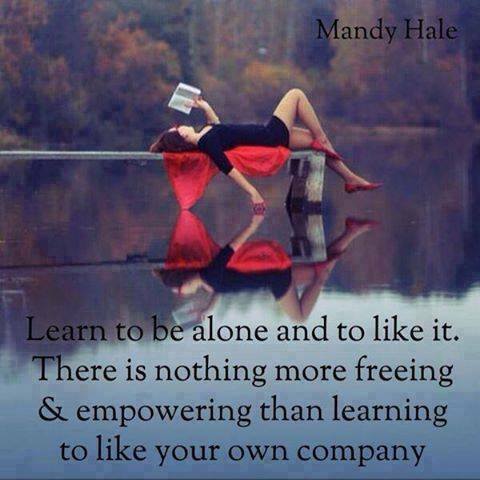 As Henry David Thoreau said, “I love to be alone. I never found a companion that was so companionable as solitude.” Neither have I. What are your thoughts on solitude? I’d love if you shared your comments below.